HANOI (Reuters) - The failure of U.S. President Donald Trump and North Korean leader Kim Jong Un to secure even a limited deal at their second nuclear summit means any breakthrough now depends on working-level talks that have made little progress since last year. The sudden collapse of talks on Thursday highlighted just how large the gulf between the two countries remains, experts said. It also underscored that whatever chemistry Trump and Kim might have, it was not enough to overcome differences that the rushed pre-summit negotiations left unresolved. In the run-up to the summit in the Vietnamese capital, Hanoi, Trump downplayed expectations that North Korea would give up its entire nuclear weapons arsenal any time soon. But officials had signaled a limited deal could lead to a declaration ending the state of hostilities that have existed since the 1950-1953 Korean War, the closing of North Korea's main nuclear facility at Yongbyon, or opening liaison offices. The two leaders began their summit by expressing optimism and the White House announced they would sign a joint declaration, widely expected to at least reaffirm the general goals agreed to when Trump and Kim met for the first time in Singapore last year. The ceremony, as well as a working lunch, was abruptly canceled. 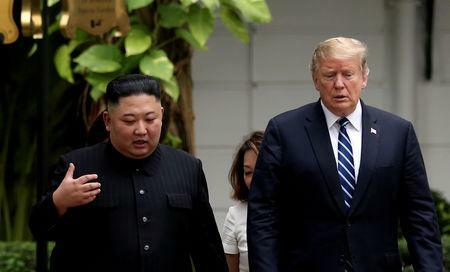 "Not only did the Hanoi Summit fail to produce meaningful results, but Trump and his team have clearly squandered the seven months since Singapore to make progress on even modest steps toward the lofty Singapore Summit goals," said Daryl Kimball, executive director of the Washington-based Arms Control Association. That stance should have been a massive warning flag to the American delegation ahead of the summit, Kimball said. Typically, major summits between world leaders are held only once officials have finalised all the details, something they were unable to do this time. “When you are dealing with a country that is of the nature of North Korea, it is often the case that only the most senior leaders have the capacity to make those important decisions," U.S. Secretary of State Mike Pompeo told reporters on his airplane after departing Hanoi. Optimists clung to Trump’s insistence that the two sides remained committed to talking as a sign there won’t be an immediate return to the threats and tension of the past. Critics, meanwhile, said the summit proved Trump's diplomacy was based on pageantry that has done little beyond reducing political pressure on one of the world's most repressive countries. Most analysts agreed, however, that the second summit ending with no or little progress made it harder for Trump to argue for his reliance on the self-described "special relationship" with Kim. "It does rather undermine the top-down approach, at least for the time being," said Christopher Green, senior advisor to the International Crisis Group. "Trump isn't going to be able to spend scarce political capital on another failed summit, so the next steps will have to come from the working level." After last year's Singapore summit, lower-level U.S. negotiators sometimes struggled to meet with their North Korean counterparts, and the recent flurry of talks only began after the summit appeared imminent. "The lack of working-level talks in the lead up to the Hanoi Summit undermined the chances of reaching a successful deal," U.S. Democratic senator Ed Markey said on twitter on Thursday, calling on both sides to "immediately continue their engagement". Daniel Russel, vice president of Asia Society Policy Institute and former foreign affairs aide to President Barack Obama, said given that "the hard diplomatic work of narrowing differences and exploring options had simply not been done," it was unsurprising that the two leaders could not close the deal. "At this point it will be no easy matter to persuade North Korea to move quickly, to deal with U.S. negotiators rather than with Trump directly, or to accept that its entire nuclear and missile program must be on the table." Many critics had feared that driven by a desire to claim a victory, Trump might make too many concessions so analysts said Trump's decision to walk away from the deal as he described it was the right one and expressed hope that working-level talks could make more progress. "By walking away from the table, Trump is effectively signaling to North Korea that they will have to deal more with (U.S. special envoy for North Korea) Steve Biegun, who faced difficulties in meeting with his counterparts in the months after he was appointed last August," said Korea Economic Institute Director Kyle Ferrier. Despite disagreements over the details, both sides appeared willing to keep talking, he said. "What is needed now are small steps to keep the diplomatic momentum going."